This friday was my (Felicias) last day in Guamote. Can’t believe time has gone by so fast! 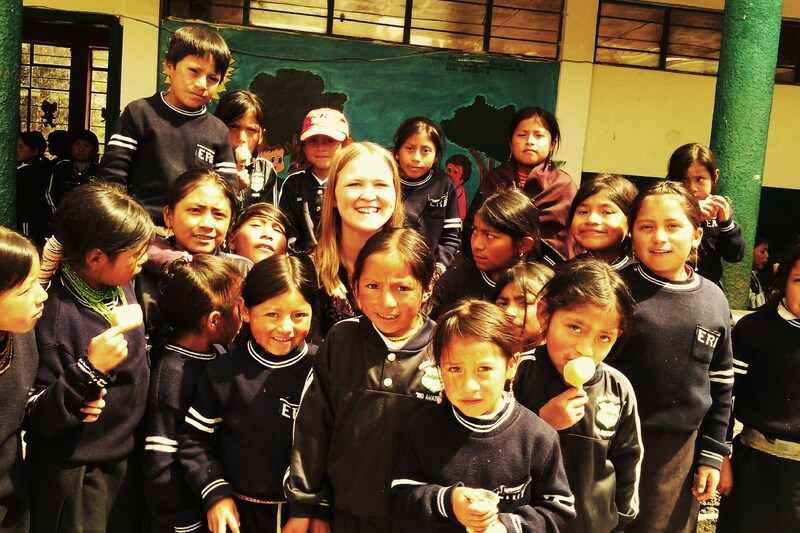 I felt sad leaving the school and the children, but I’m happy since Celena (another of our TEV-volunteers) will stay and continue working with them for a few more months! Although, after summer, these little children will once again be in the need of an english-teacher, maybe are you that person? Okey, I’m not gonna make this blogpost sound like a cheesy commercial…. But still, don’t hesitate! Come on over and carry on our work! If people keep coming every year these children will be fluent in a few years, that’s how eager they are to learn!! It is Tuesday, the last day of Carnaval break. I thought I would take the opportunity to write about the event that Carnaval has been! 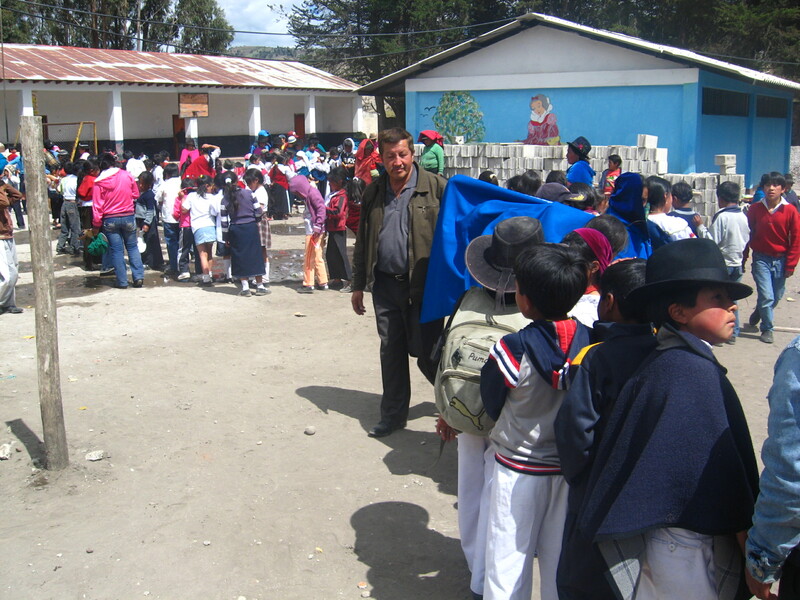 Carnaval festivities began my first day back at school here in Ecuador. I diligently planned my lessons for each of my four classes the evening before, but lo and behold, Friday when I arrived at Joaquin Chiriboga, I was told that there would be no classes. 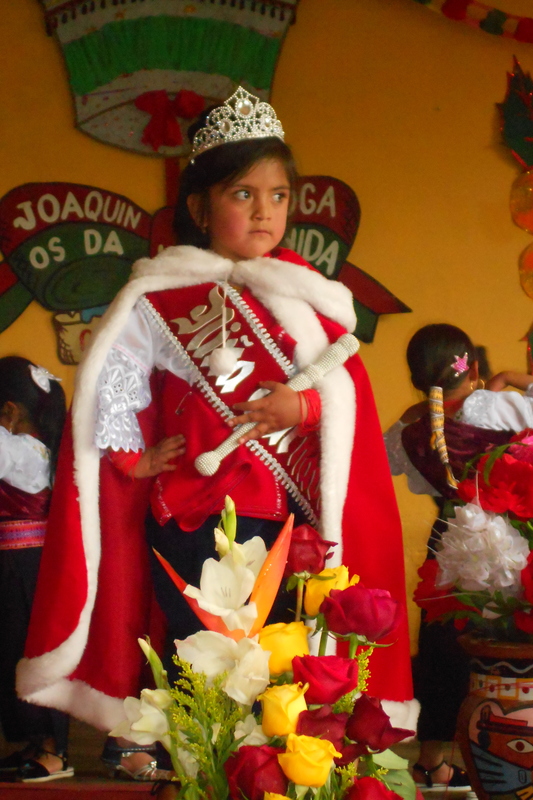 Instead, we would be having an all-day Niña Carnaval Pageant. The parade was just over a week away, and deciding which little girl would get to sit atop the school float and wave was serious business. The girls spent a good three hours preparing. Once the program began, it consisted of about an hour of very made-up 5-6 year-olds dancing, modeling various outfits, and strutting down the cat walk. When it was over, we had our Carnaval Girl. And the winner was the adorable Tatiana! 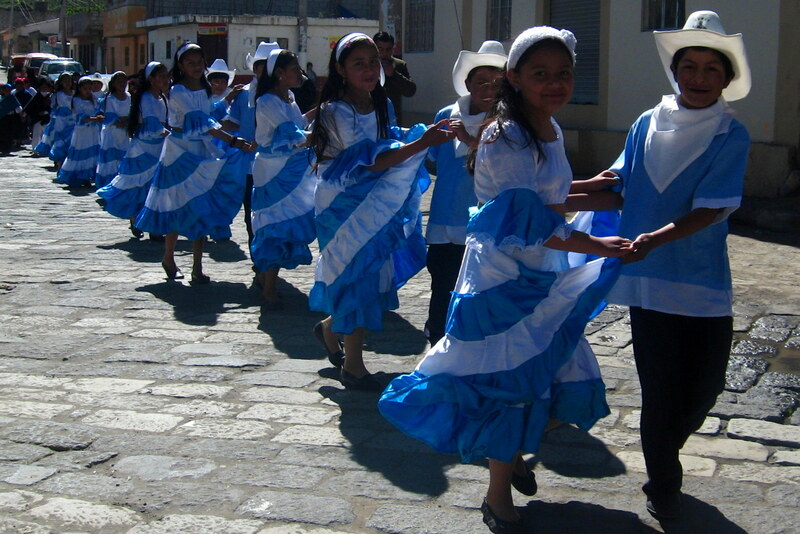 Over the next few days, people kept telling me what Carnaval was like in Ecuador. Depending on which town you were in, it entailed 1-8 days of tradition, parades, and chaos. Yes, chaos. 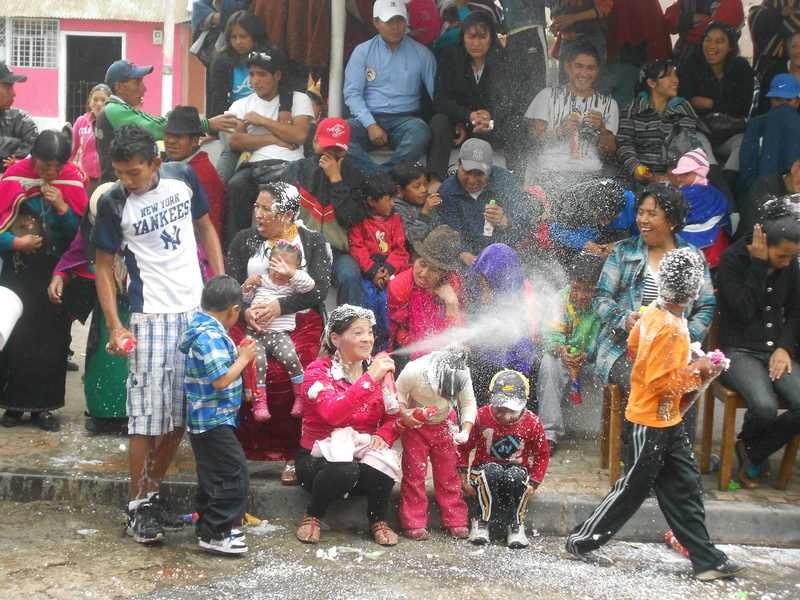 Ecuadorians like to play their “Carnaval Games,” which involve using water, flour (colored or normal), eggs, and caraoka (this foamy silly string sort of stuff you spray out of a can) in what becomes a family, school, friend, or town-wide fight. Anything is fair game- you don’t have to know someone walking down the street to spray them with your watergun (or as I saw, sit on the rim of your truck bed, which is filled with water, and dump buckets on people walking down the sidewalk). All social rules are out the window during Carnaval. I’ve never been that competitive, or into getting super dirty. And I knew that I would definitely be a target for those playing Carnaval games. About a week ago, I was working away on http://www.hostelworld.com, trying to find a peaceful place on the coast where Bekah, one of my fellow volunteers, and I could spend Carnaval weekend and avoid all of the craziness (I was trying, but not finding- during Carnaval break, tons of Ecuadorians flood to the beach, making it hard to find room in any inns). 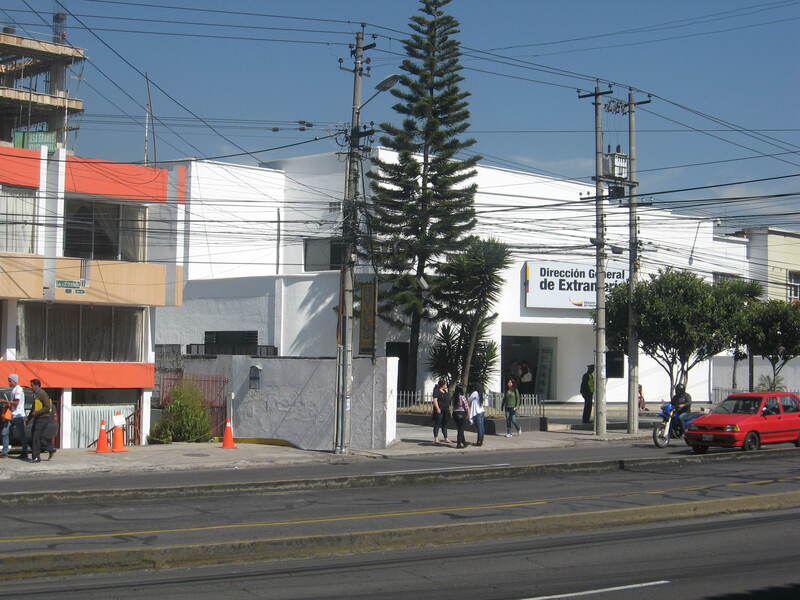 However, each Tuesday night, all of us volunteers go to Riobamba’s Casa de la Cultura (culture house) for its showing of a free independent film. It’s definitely one of my favorite traditions here. 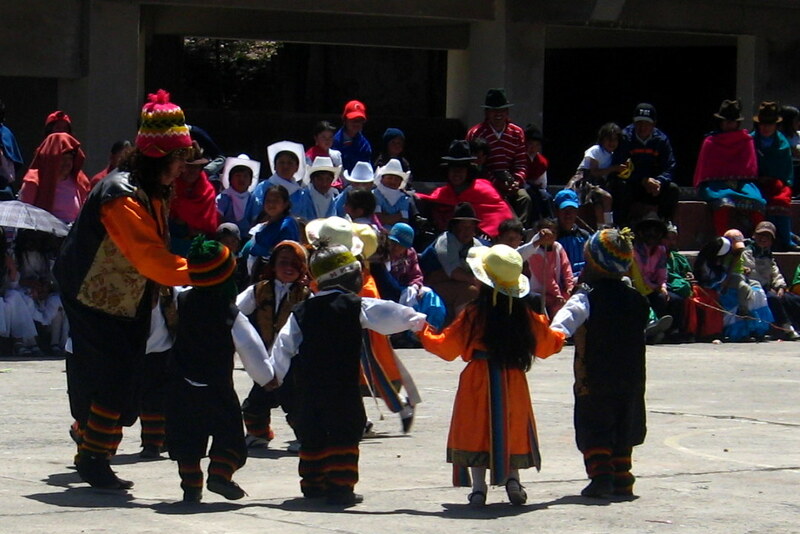 Last Tuesday, the movie was a documentary on Carnaval in the Chimborazo Province (where I am). Watching it made me see Carnaval in a different light. It looked like a traditional, tremendously fun holiday in which everyone is allowed to let go of any stress and just act like a child. 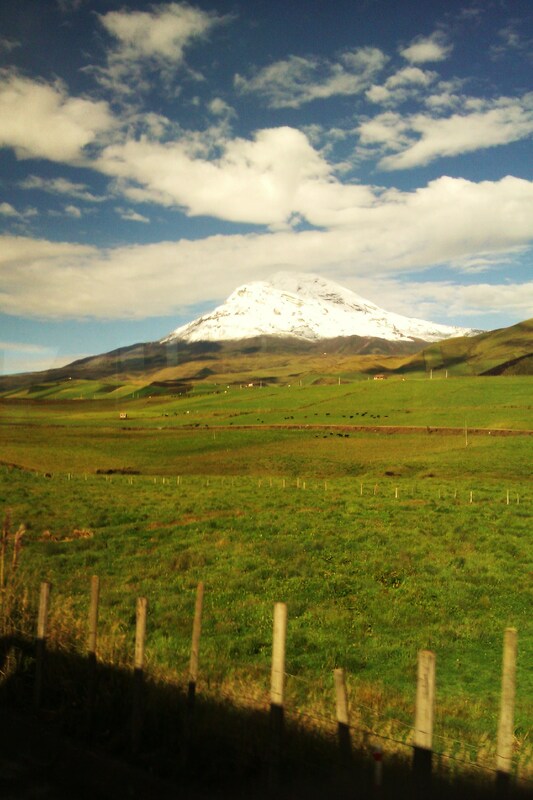 And, apparently, Chimborazo, probably because it is a highly traditional province and would never practice a tradition half-heartedly, had the craziest Carnavals in Ecuador. So, I decided that to flee would be stupid. I got my first taste of Carnaval games this Friday. 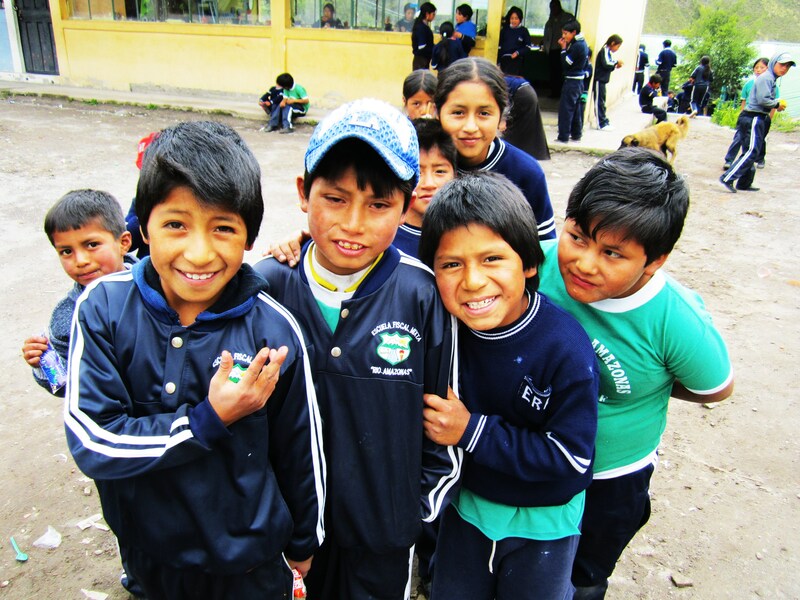 I did my best to work with them, since I hadn’t taught them in two weeks, but once recess came, they did nothing but play with water and flour. I figured there was no reason for me to be there, and tried sneaking out quietly, however, the entrance door was locked. No, I’m trapped! As I was turning around to make an effort to find the janitor/ secretary/ school attendant who has the keys, this cute, deceivingly innocent looking little girl with her hands behind her back approached me and smiled. “No, noooo!” I said, but she sprayed me with her caraoka. Then, it was like I was a swimmer with a fresh cut in a sea of sharks- the kids all seemed to realize that I was there and they herded toward me, equipped with their water, caraoka, and flour. I bolted back toward the courtyard and ended up having to play Carnaval games out of defense. About half an hour later, I made it out of the school, dripping wet. But, I was smiling. It was the most fun I’d had in a while. During my bus ride home, I realized how intense Carnaval truly was; how crazy it made people. Passing through a small town, someone sprayed caraoka through the open bus door at some of the passengers. 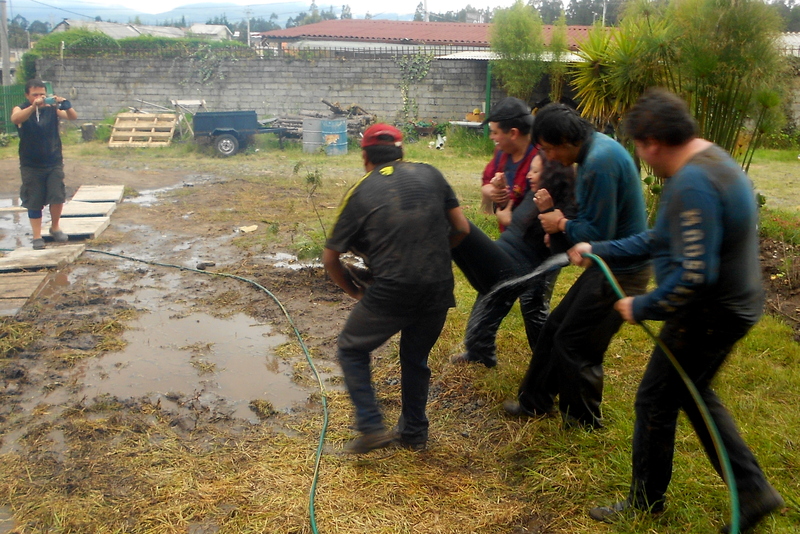 Upon arriving in Riobamba, I saw scads of people battling with water in the streets. Dozens of people were rinsing their Carnaval remnants off in this decorative fountain. I witnessed someone chuck an egg out of his apartment window at a complete stranger- it cracked on her back and she looked at the sky with unsurprised anger. When it was time for me to exit the bus, I did so with calculated caution. Every person walking by, every car passing me, every building I walked beside held a potential assassin. I immediately entered a store selling caraoka and polvo (dyed flour), so that I would be ready for any attacks. Here’s an anticlimactic moment: I didn’t get hit once during my ten-minute walk home. Maybe people saw how thoroughly wet I already was and had mercy on me. My Carnaval action picked up the next day, however. 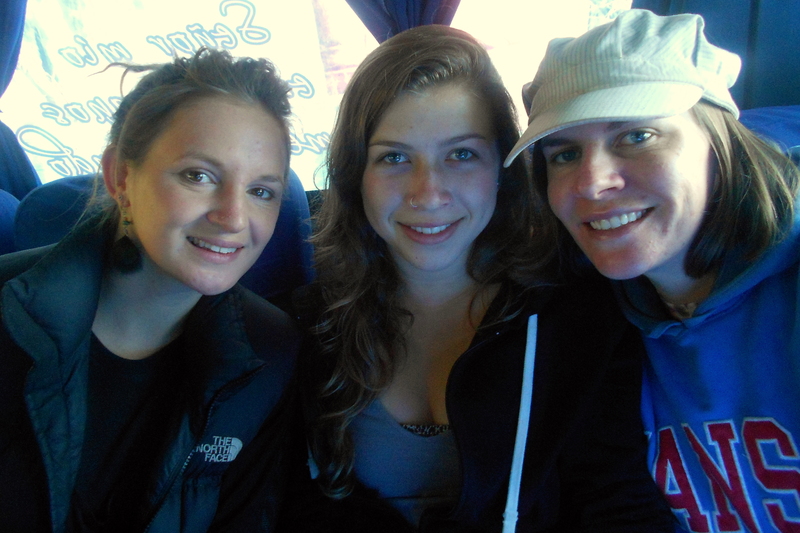 I traveled to Quito with my host mother, her daughter, and her two children. After treating myself to sleeping in until 9 am, we headed to a Carnaval party. I wore exercise clothes that I didn’t really care about, and carried a fresh change of clothes. The things you have to do to be prepared for the games. We arrived around noontime to a house buzzing with activity. Lunch was being prepared, children were already at it with the games, a bonfire was being sparked. 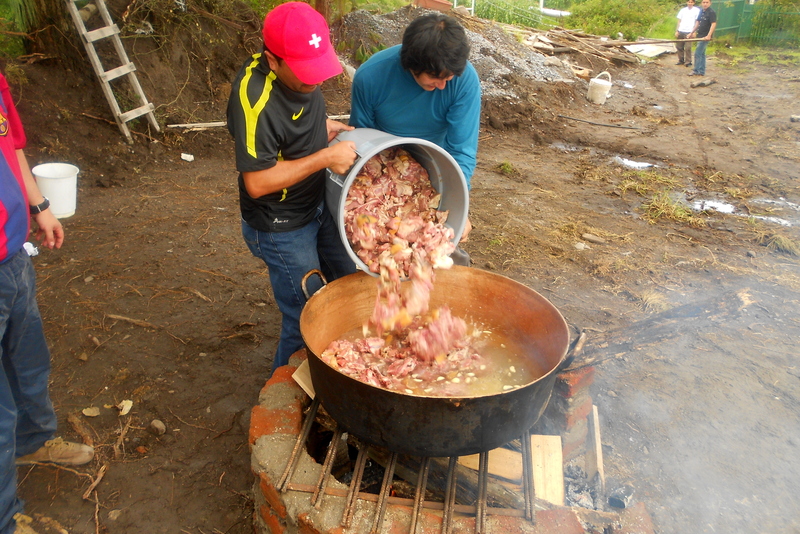 My host mother´s oldest son, was chopping up his second pig, with a machete. 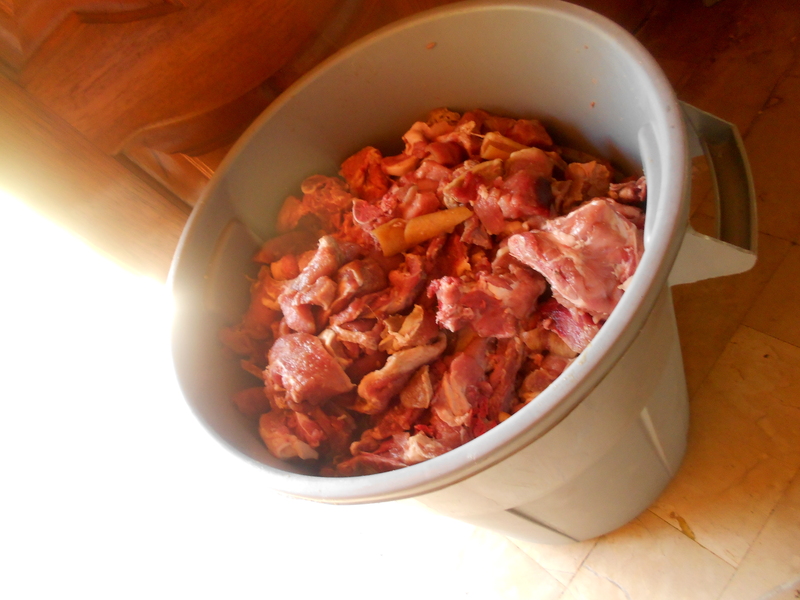 He was tossing these pig parts into a (clean) trash container. Fritada (slow-cooked pork that simmers in a pot of water, oil, and seasoning for a few hours), mote (really tasty, tough corn kernels), empanadas, and salad were on the menu. A whole lot of pig. I can only imagine how heavy that bin was. It didn’t take long after our tasty traditional lunch was through for the games to begin. I was expecting caraoka, flour, and water. But things went in a direction I did not expect. MUD. I’ll demonstrate, using the following two pictures, exactly what happened to just about every person at this party (the only people safe were the pregnant women [there were three of them there! ], small children, and old ladies). Carnaval did not stop there. 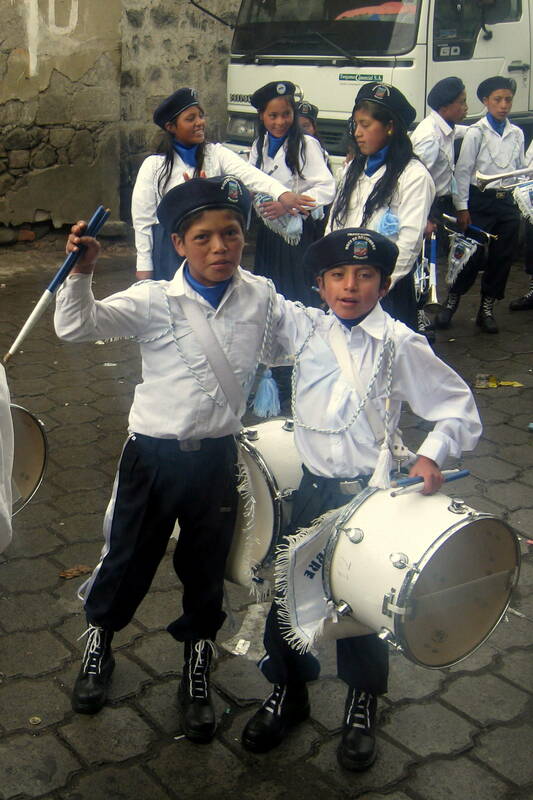 I left Quito on Sunday morning so that I could make it back for Guamote´s notoriously crazy parade morning. 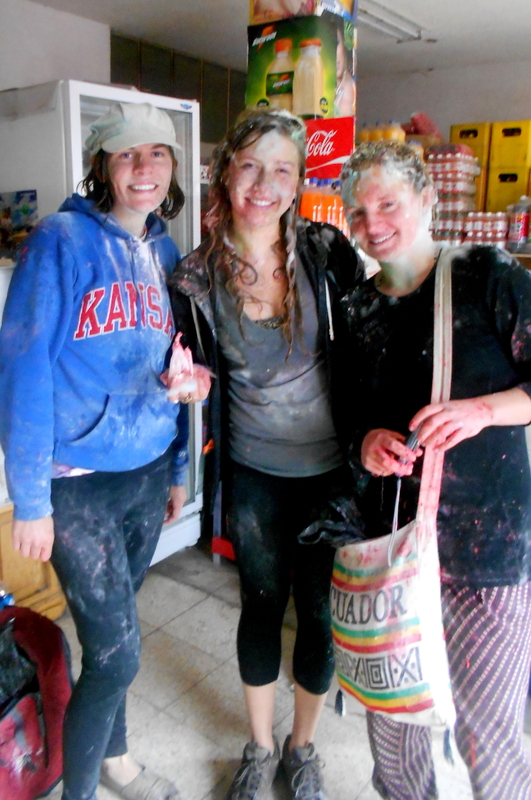 Volunteer friends Alice and Bekah joined me to witness the spectacle of a Guamote Carnaval. Here we are on our way to Guamote. Notice how clean we look. 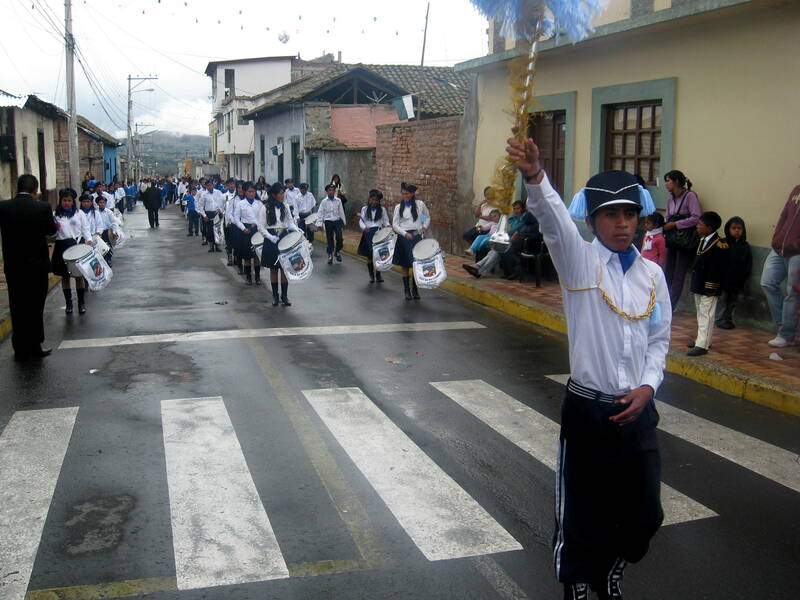 In classic Ecuadorian fashion, we were told the parade would start at 8, so we planned to arrive at 9, and it didn’t even begin until around 10:30. In that hour and a half, we helped ourselves to the array of delicious fried foods being served by the street vendors, I greeted my students (who were dressed up in their cute costumes for the parade), and we found a good place to sit and watch. Once the parade got going, the gaming began. 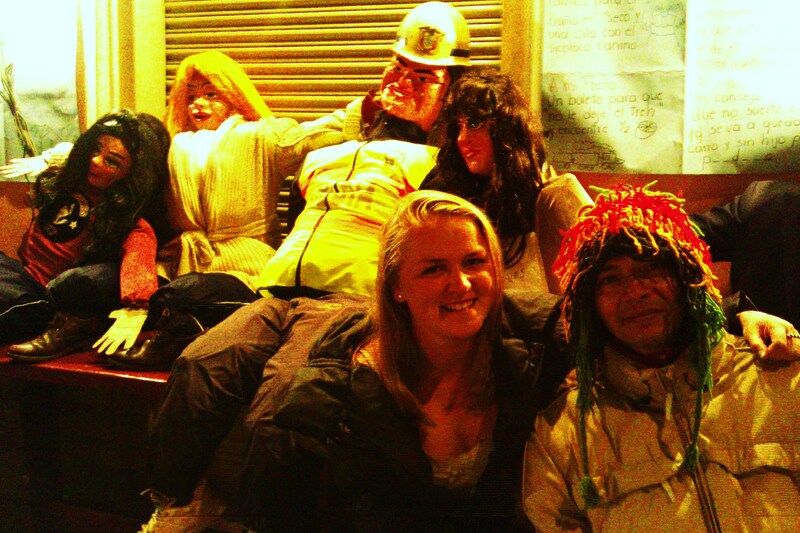 These people were seated across the road from us. This picture is part one of the sequence. Notice the woman who has just been rudely sprayed in the face. Part two: Please notice the guy on the left who has just been, to his surprise, soaked and the woman getting back at the kid who sprayed her. This is probably my favorite picture from the entire morning. The parade lasted for four hours (we watched for the first three). Over that time, things just got wilder and wilder. I think most people were drinking (including us…), which had a fair amount to do with that. Check out all the caraoka!! The poor dancers in the parade were absolutely covered in Carnaval ammo. When my school float finally approached us, I excitedly greeted the director, just about every student, and my coworkers with a friendly spray of caraoka. It was so fun seeing them. There’s a very caraoka’d Niña Carnaval Tatiana, continuing to wave to an increasingly inpolite crowd. People, without a doubt, attacked us because we stood out. Anytime we had to go to the bathroom, it was worse, because we had to walk a couple of blocks beside the parade and became moving targets for parade-viewers. The worse was when someone sprayed caraoka on your face- especially when it got in your eyes. Man, did that sting. Or in your mouth- ew. There was one cheeky old man, in particular, who took considerable joy in getting us. He managed to sneak behind both Alice and Bekah and crack eggs on their heads. He tried to do this to me, but I was the one to cracked the egg on his head Although I may have won the battle with him, I think it’s safe to say that we lost the Carnaval war. 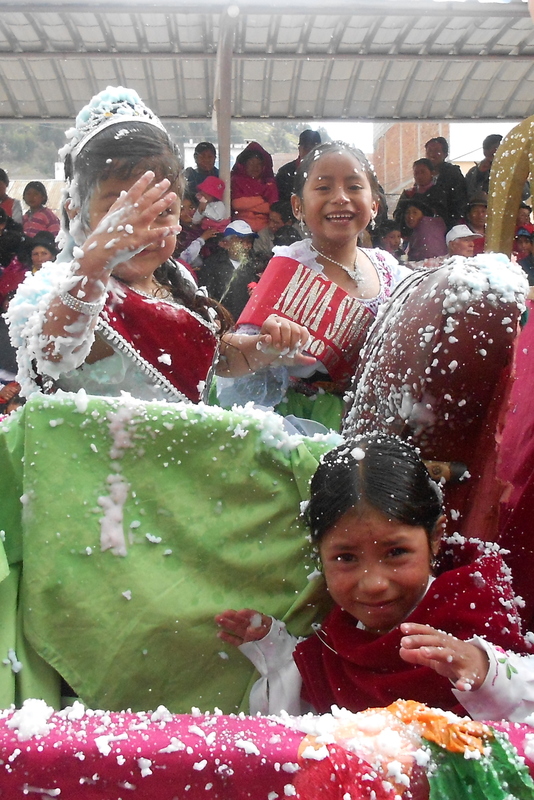 When we returned to Riobamba, it was with flour-caked faces, caraoka and polvo-stained clothes, and water and/or eggs all over. 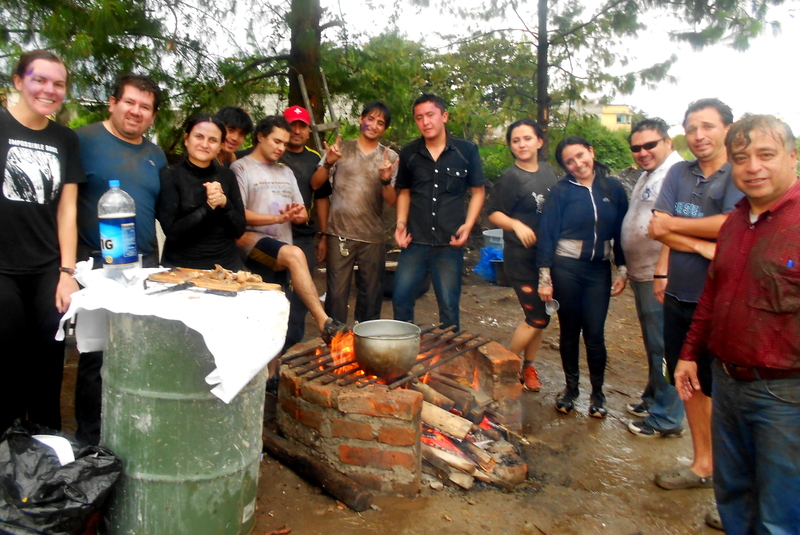 We were, easily, three times as dirty as the average Ecuadorian in attendance. Still- actually, I think because is a more appropriate word-, it was an incredibly fun time. I’m now nice and clean, and I managed to get all remnants of Carnaval out of my clothes. Today is the last day of Carnaval break, so in Riobamba’s main street, people are continuing the craziness with a Carnaval war, but I’ve had my fair dose of Carnaval and am hiding in my room, blogging away. I’m so glad I stayed here to enjoy Carnaval, but I think I’ve had enough… Happy Mardi Gras to you readers in the states! It’s a cousin of Carnaval, you know. Since Tricia uploaded pictures of her BEAUTIFUL añoviejos, I just felt the urge to show you ours to! Today I had a GREAT DAY in Guamote, and my students seemed to remember everything I taught them before the christmas-break. HAPPY HAPPY TIMES. A hard feeling to describe, I was so PROUD in some way! 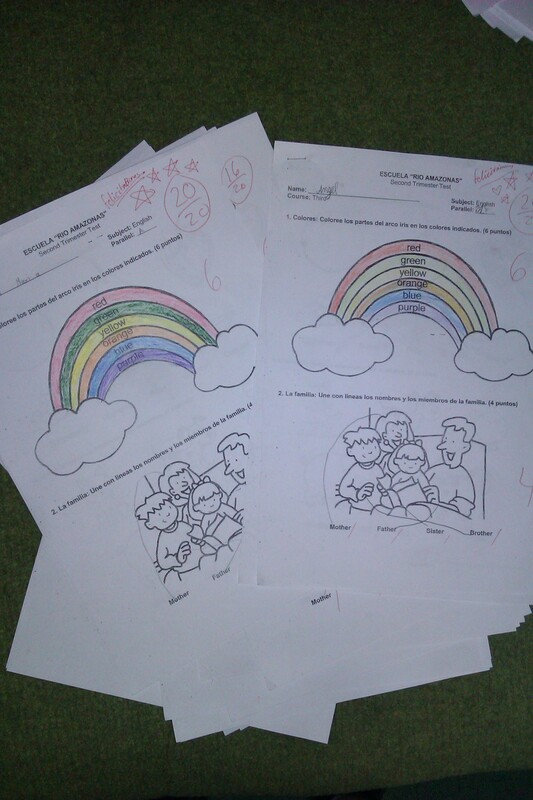 This is a picture from today, how I like my cute little students! Tricia, again, this time here to explain (in an admittedly lengthy post) the other December holiday, New Year. That’s always how I’ve considered New Year- kind of second to the magic of Christmas. But this year, New Year won by a landslide. 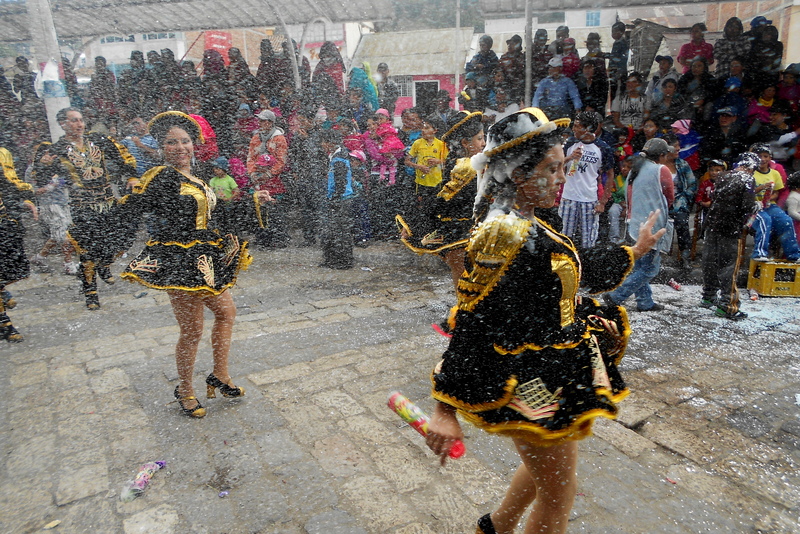 Ecuadorians know how to ring in a new year. For the last several New Year’s, I’ve had to work until around 10:30 (I worked for almost 4 years in an upscale restaurant), then, tiredly, head to a friend’s party. I think there may have even been a couple where I just went home, or went to a bar with coworkers. As midnight approached, we gathered in anticipation, did the countdown, then cheered. I would leave within twenty minutes of the year turning. Definitely not a favorite holiday- fun, nonetheless, but nothing terribly special. Maybe it was the newness of it all, or it could have been the fire, but this was my favorite New Year I have ever experienced! 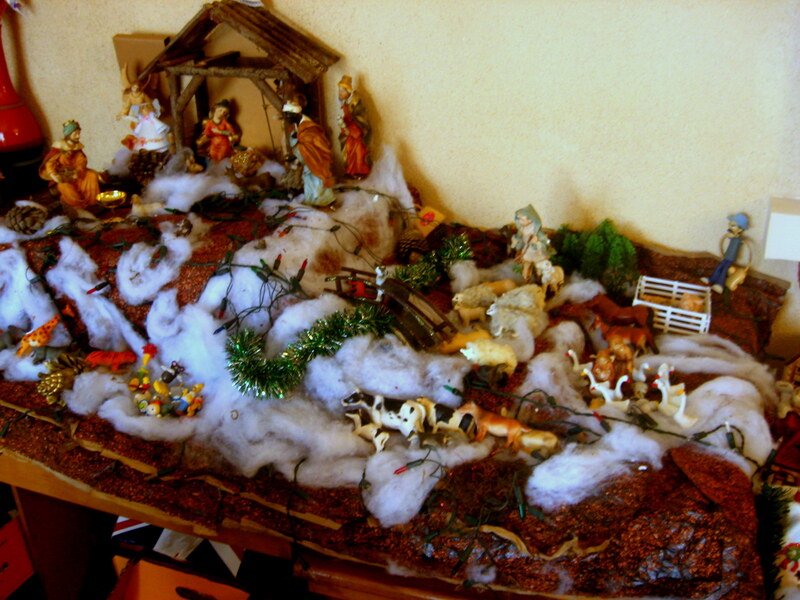 It more than made up for any melancholy of being away from home during Christmas. 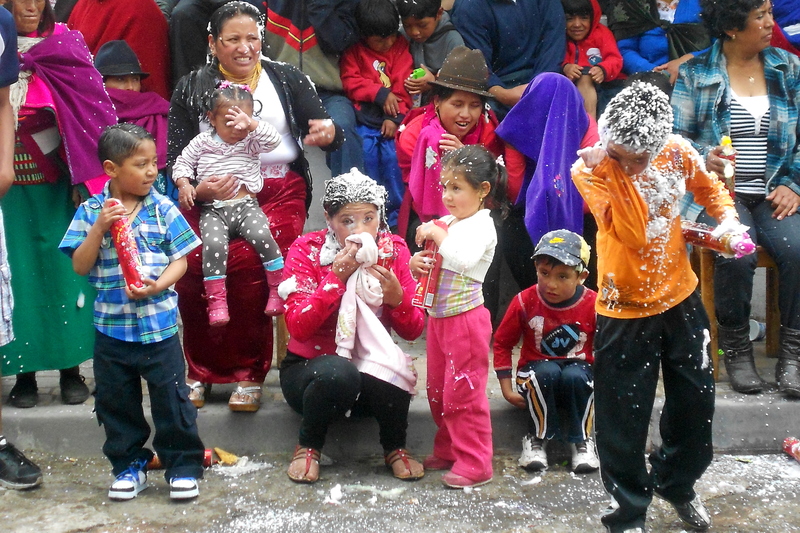 I’ll break down how we enjoyed the holiday here, so you can see why I fell in love with the Ecuadorian New Year. Tradition #1: Muñecos de Año Viejo. 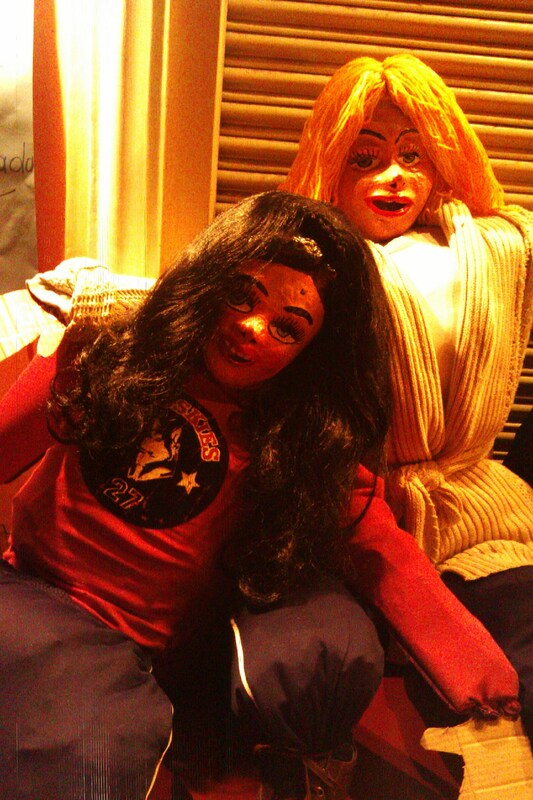 Translated “dolls of the old year,” these dummies represent the year that is about to pass. 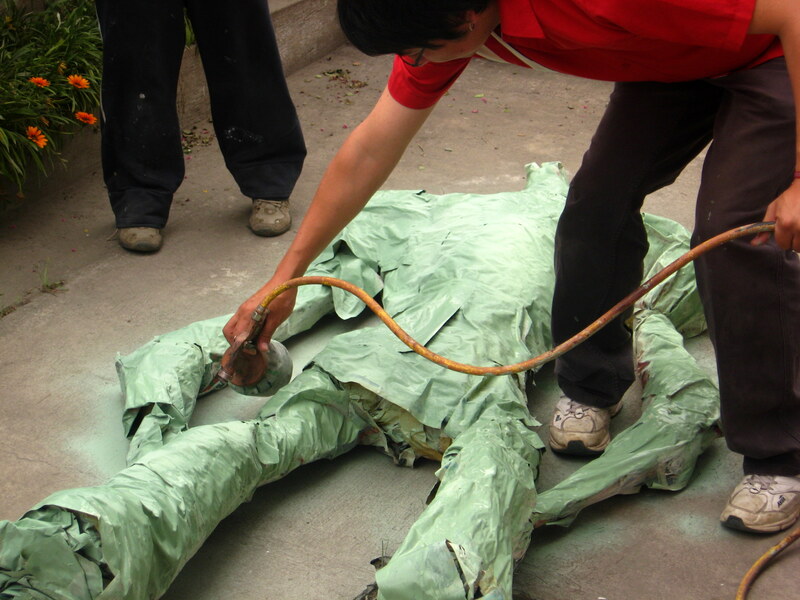 They are made out of clothes, wood, or metal, then covered with paper mache and painted to resemble people, cartoons, or animals. Here in my host family’s house, we set to work creating our own muñecos. 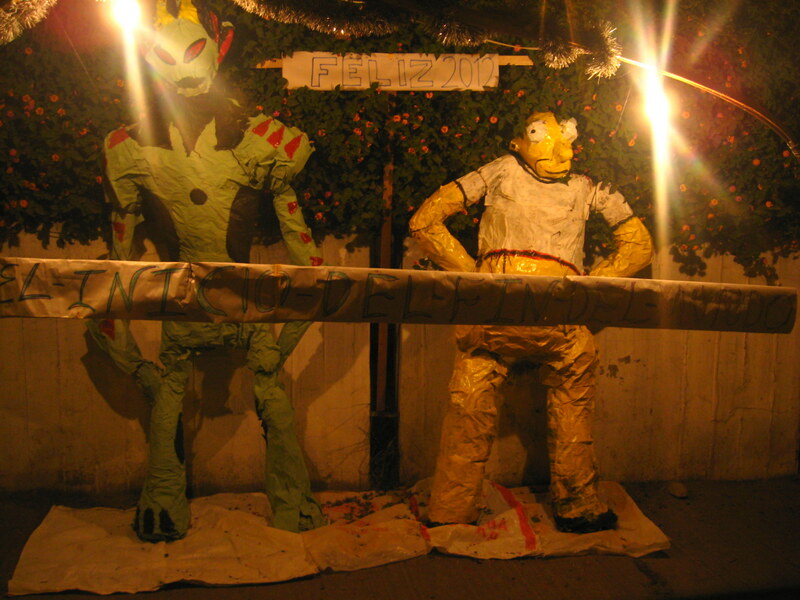 Once it was dark, our muñecos were put on display outside the house, so that passerby’s could view our creations! The sign reads El inicio del fin del mundo- The beginning of the end of the world. Dramatic, yes! 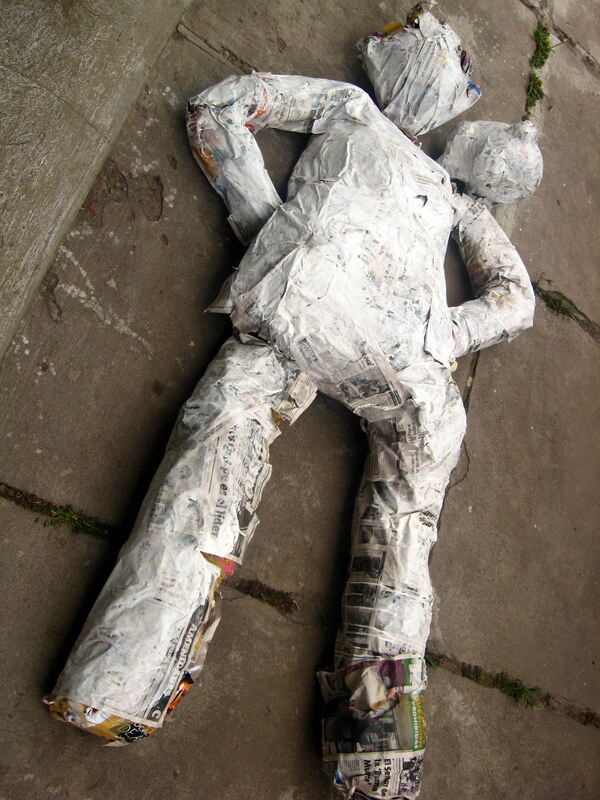 At midnight, without a thought of all the time that had been put into making these, my host brothers threw them down into the street and lit them on fire. I don’t think I really need to get into the significance because the names say enough- the “old years” are being burned. 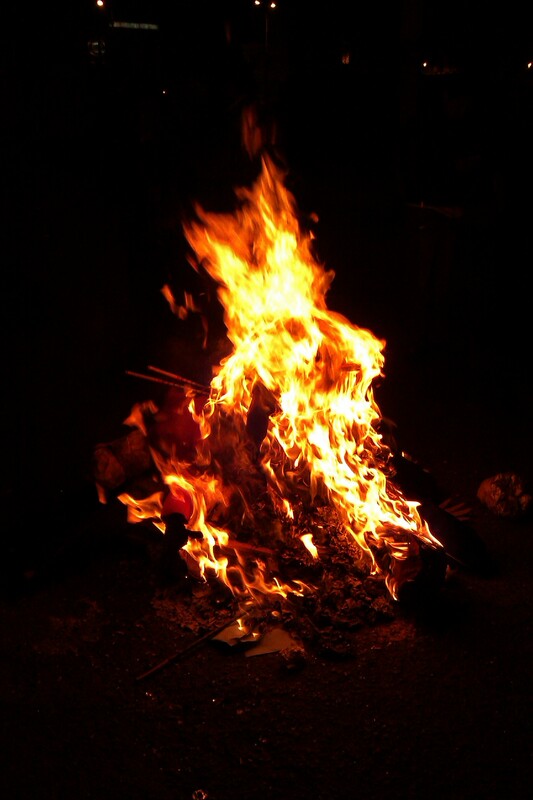 With the coming of a new year, burning these dolls is a tangible reminder of the passing of another season of life with the hope of a new one beginning. Plus Ecuadorians like fire. 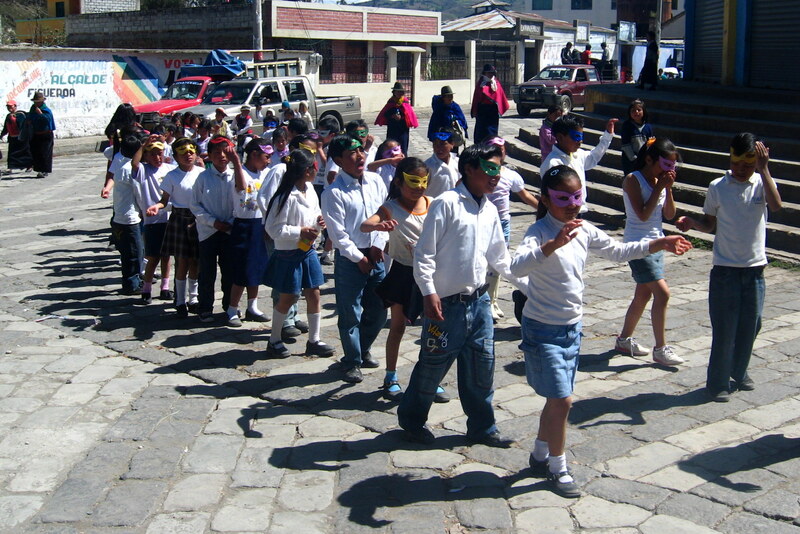 Tradition #2: Kids stop traffic and pander for small change. I didn’t see this tradition coming, and found it HILARIOUS. 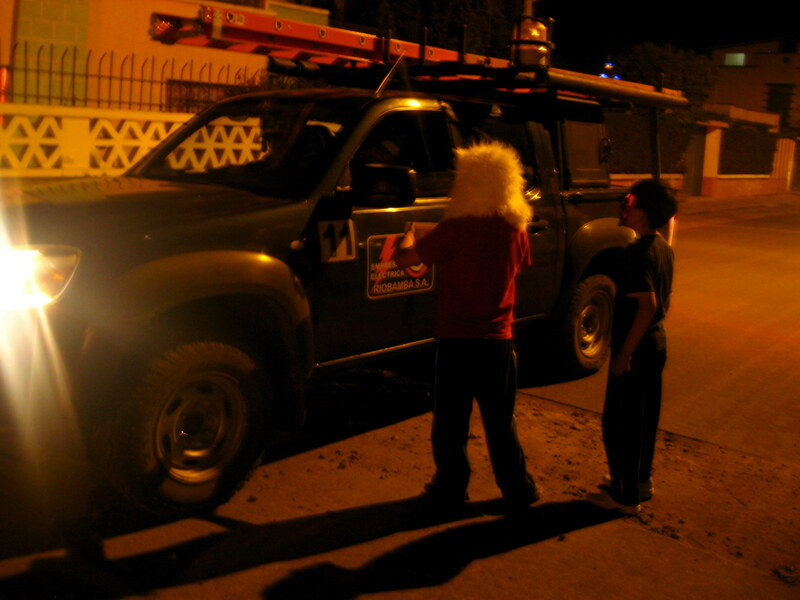 Three of my host mother’s grandkids, around 7 pm, put on masks and grabbed a few shoe-boxes. My host brother helped by obtaining a large rope, as thick as a garden hose. Our house is on a street corner, so he tied one end of the rope to the corner of our driveway and stood on the catty-corner. Both streets near our house are one-way streets, so whenever a car approached from either of the two directions, he pulled on the rope, tightening it so that the car could not pass. Then, the kids would run up to the car and hold out their shoeboxes. The driver would roll down the window and give the kids a few centavos, then brother (haha, I feel like I’m writing a Berenstain Bears book) would loosen his grip on the rope so that the car could pass. In the US, it would totally not be legal! Here, completely normal. They did this for, I’m not exaggerating, four hours and made a total sum of about $9. Weirdest tradition ever, but they loved it! Tradition #3: New Year Trinkets for everyone. I helped two of the women in my family assemble little jars for each member of the family who was celebrating with us. In each jar, we put about 25 cents, some rice and bits of paper (decoration/ filler), and I wrote a one-word fortune to put in each one. Like happiness, love, friendship, luck, etc (of course, I wrote the words in Spanish, so I checked the spelling with my host sister on almost each one before actually writing it!) Just before midnight, we gathered in our living room and sister handed them out, along with some cherries (traditionally, they eat grapes, but the cherries were delicious so I was fine with the change). Then, everyone opened their jars and had to share a hope for the new year and read their paper fortune. 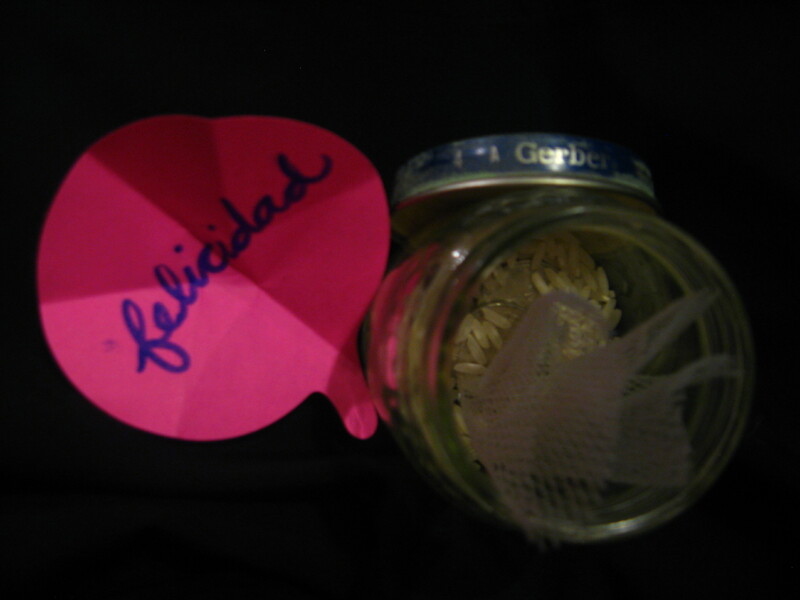 My self-made fortune was happiness, or felicidad. Tradition #4: Reflection. Around the time that we opened our little Año Nuevo jars, we were given three pieces of paper. On one, we were to write everything we were excited to let go of from 2011, all of the bad things that had happened. On another, we were to list our favorite things from 2011. On the third, we had to write wishes for 2012. When we were done, we put our papers into a small bag. No one looked at them- they were for the authors’ eyes only. 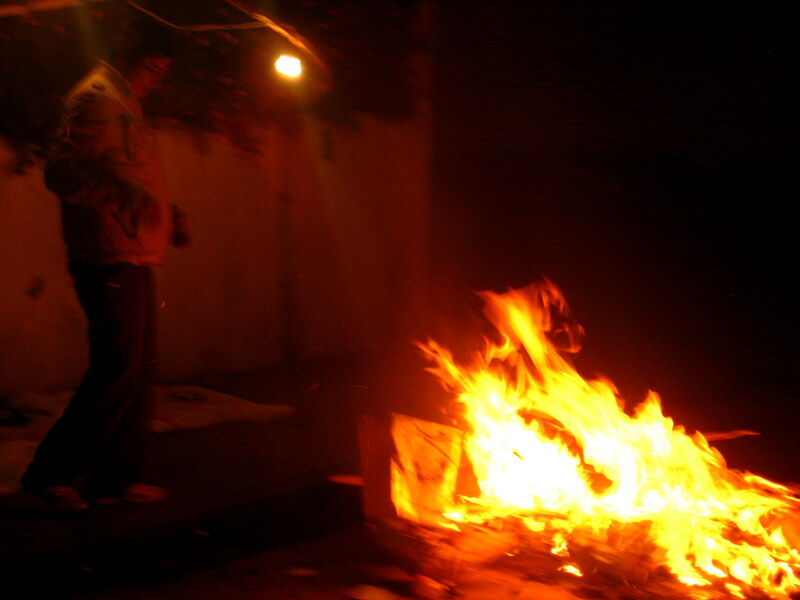 At midnight, when our Año Viejos were being burned, one of my host brothers threw in the bag of our written disappointments and dreams signifying that whatever painful things we had endured in the previous year were now through, and the good things and things we wished would come were no longer on pieces of paper but, more importantly, in our minds and maybe in sparks and ashes that would float upward into the stars to a universe or deity that could maybe do something to help us along in the coming year. Tradition #5:Late-night phone calls to friends and family far away. 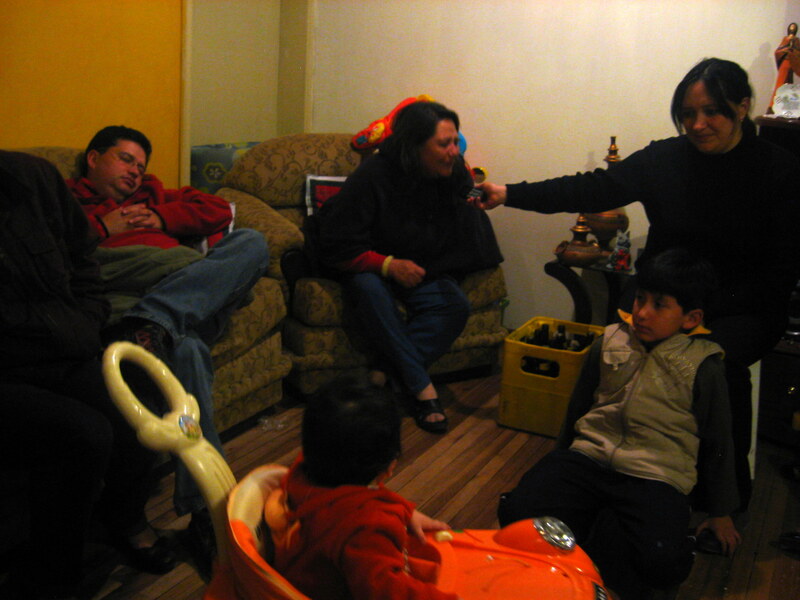 While we were gathered in the living room, my host mother made several phone calls to relatives (around 11:50 pm). The family asked if I was going to call my parents and I laughed, because they were most definitely sleeping. Here, everyone was awake, from the babies to the grandparents. Tradition #6: Midnight hugs. After counting down, everyone hugged everyone, the way people are sure to clink glasses with each person at the table when making a toast. In a country of cheek kiss greetings, I rarely give or receive actual hugs, so this was nice. 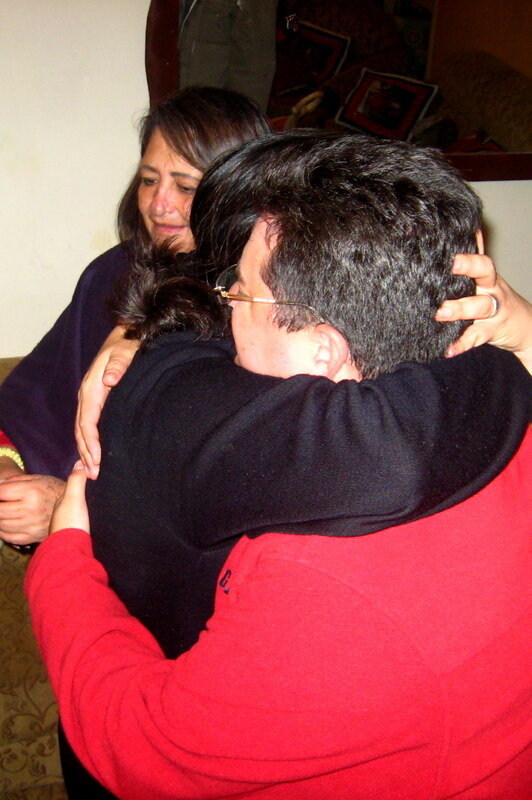 When my host mother hugged me, she said, almost tearfully if I’m not mistaken “I’m so happy to have you in my house!” And I realized how incredibly happy I was to be here too. Tradition #7: The suitcases. After everyone had completed the round of hugs, we grabbed a couple of backpacks that had been packed earlier that day and ran out the door. We then circled the block with our backpacks. This short trip with baggage during the first few minutes of the new year is taken in hopes that the year will turn out to be one filled with travels. By taking a couple of minutes to walk around the block at something like 12:05 am, we were doing our part to ensure that 2012 would bring with it plane tickets and opportunities to visit faraway places. I couldn’t have loved this tradition any more. 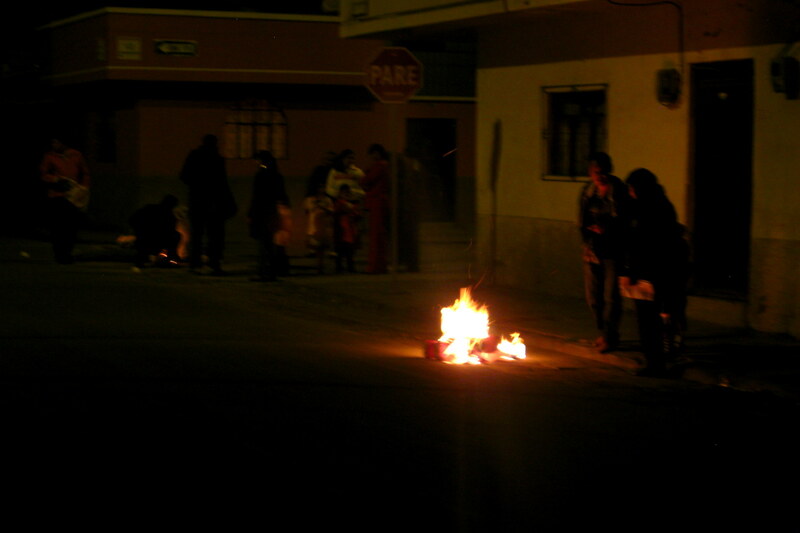 While on our mini-trip, I was able to see families all over burning their muñecos and bits of paper. The streets were completely alive with light, smoke, and laughter. Tradition #8: Fireworks. From about 11:45 to 12:30, the sky was ablaze with fireworks from every direction. It was incredible. We just had sparklers and a few roman candles. 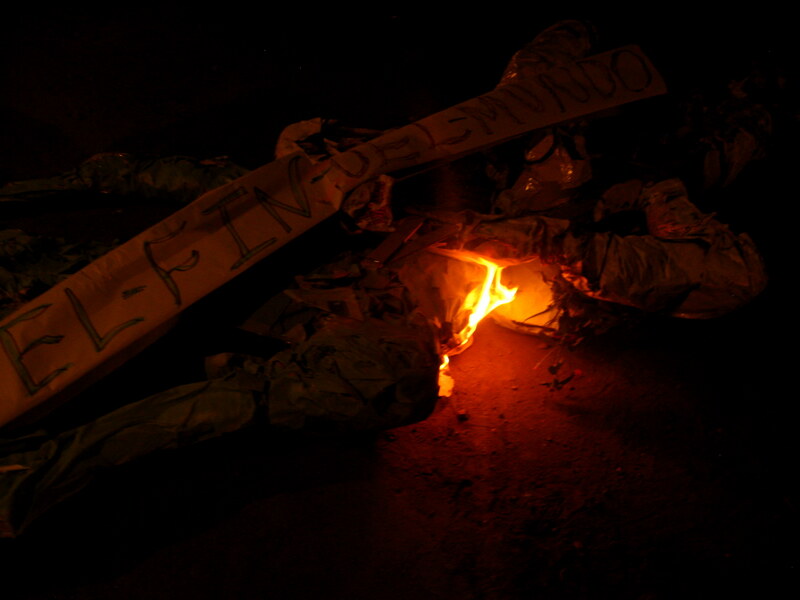 Ecuadorians are such pyros. 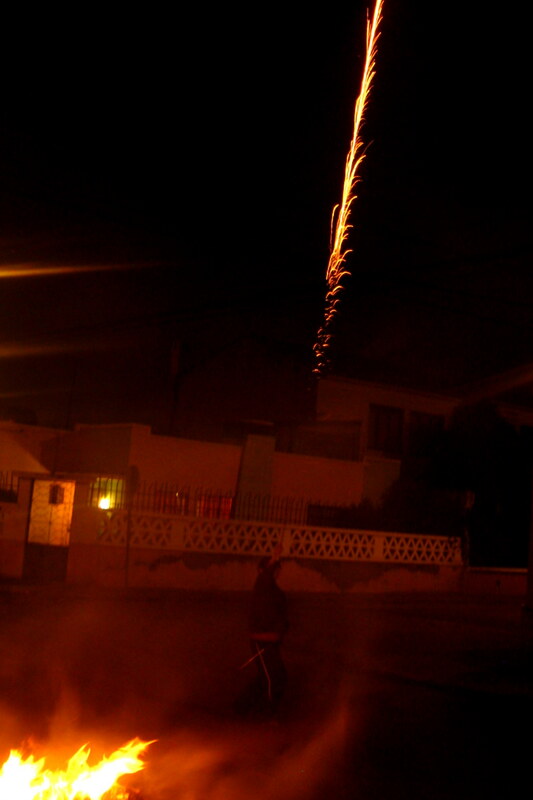 One of my host mom’s grandsons holding the exploding roman candle. Tradition #8 (last one! ): the next-day/year cena. Just like Christmas Eve, we didn’t eat dinner until late. This time, it was planned. 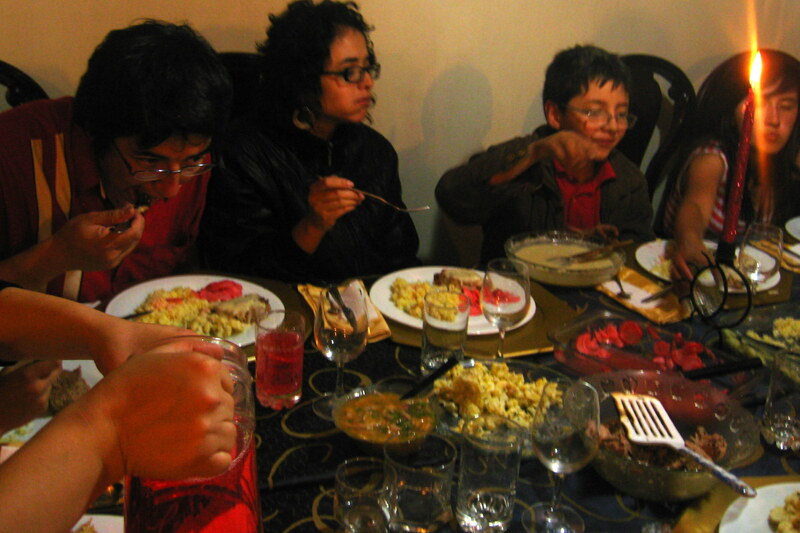 Eating the New Year banquet (much like the Christmas cena with turkey, rice, etc.) is the last thing you do before finally going to bed. We started eating at around 12:30. Unlike Christmas Eve, I was full of energy from all of the exciting new traditions, fireworks, and fun, so eating that late didn’t feel very strange. 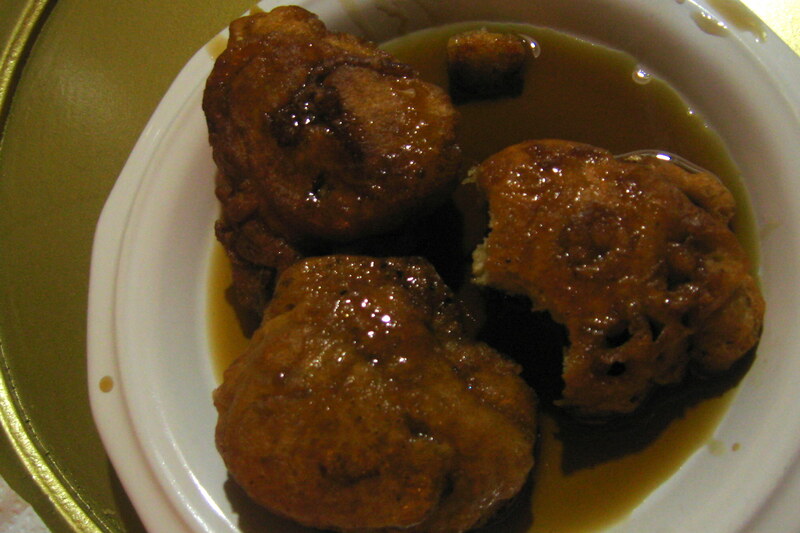 Following our dinner was the buñelos, as traditional a holiday dessert as pumpkin pie in the US. I finally went to bed around 2, feeling so content with my 2012 kick-off. Happy New Year to all of you reading this! May it be full of all of the good fortunes I wrote in Spanish on those pieces of paper. Tricia here… Tomorrow, Christmas/New Year break ends and I go back to school. I wanted to take a minute and share some of my written thoughts on the holidays here. I’ll begin with Christmas. All my life, Christmas has meant pine trees, dazzling Christmas lights, this 1980′s Avon advent calendar, New Testament readings, Christmas letters from friends and family afar, specific gift lists of what I hope to buy for each member of my family and close friends, snow, baking and indulging in Christmas cookies, Christmas carols and Christmas movies, my one church service a year, and finally, a morning of opening stocking stuffers, a tasty Christmas breakfast, then the opening of the presents under the tree, and finally, the mid-afternoon Christmas lunch (turkey, stuffing, mashed potatoes, casserole, and dessert). Christmas here was not that different than what I was used to. It lacked cold weather, Christmas letters (I guess they’re not done here), pressure to buy expensive presents for every loved one in your life, English, and baked goods. Things involved in Navidad here that I was not used to included: buñuelos (fried balls of dough served with a thin honey sauce), Christmas programs in every school here, endless parades, fireworks, live music late into the night of Christmas Eve, huge nativity scenes in every home and school, an increase in crime, Novena- the tradition of gathering together and praying for 9 days before Christmas, beginning December 16th, and the tradition of giving bags of candy to children at schools. 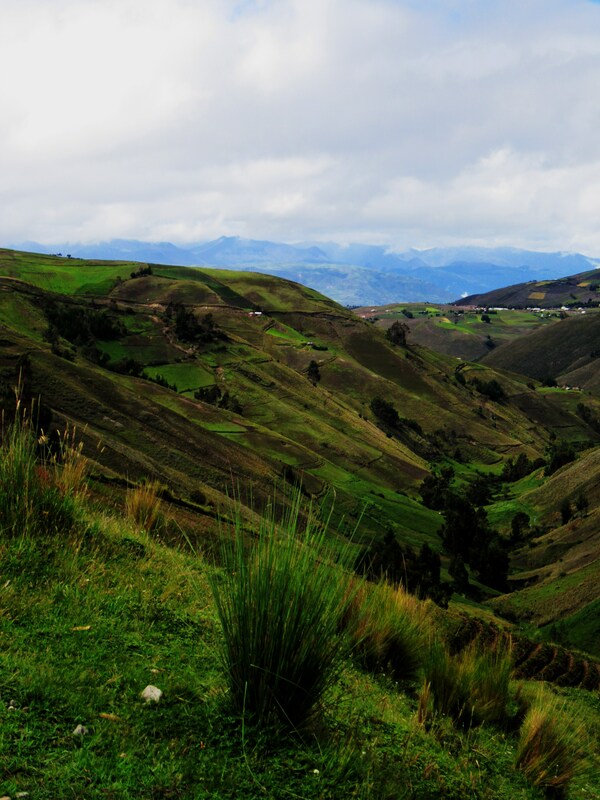 I enjoyed the holiday season in Riobamba very much! 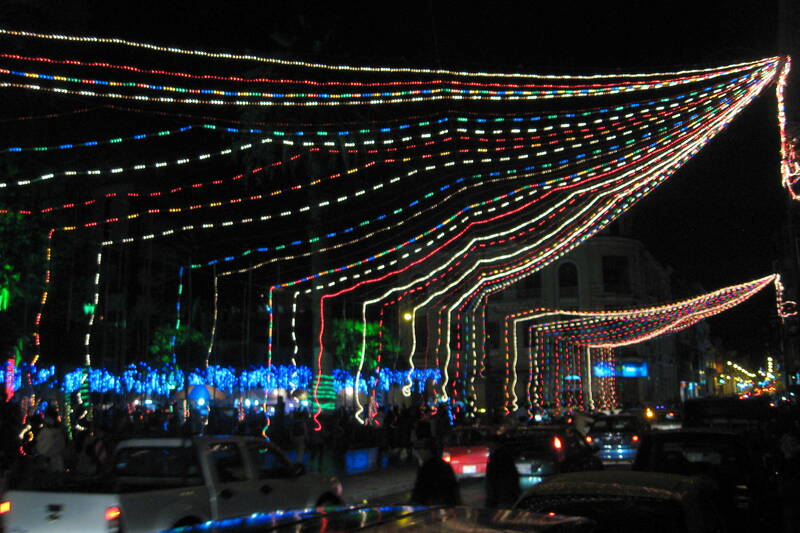 About three weeks before Christmas, the center of Riobamba came alive with Christmas lights. 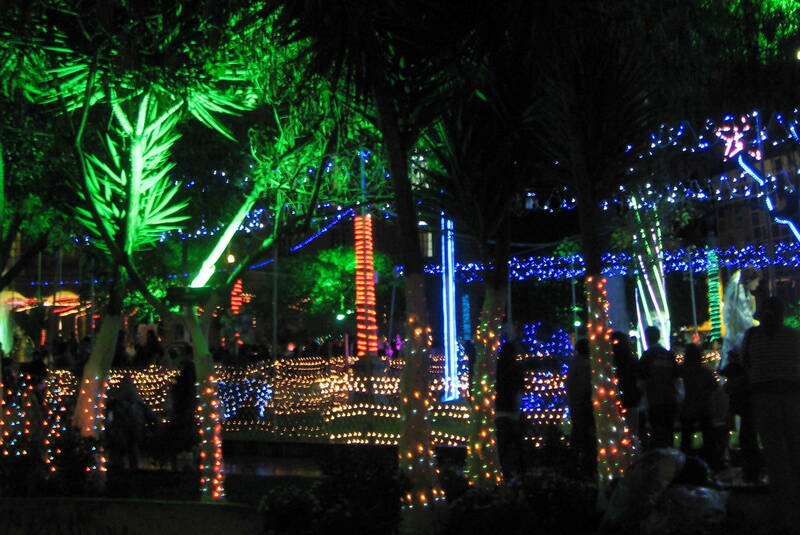 Parque Sucre was a hub of activity and Christmas spirit! Onto the Christmas programs. 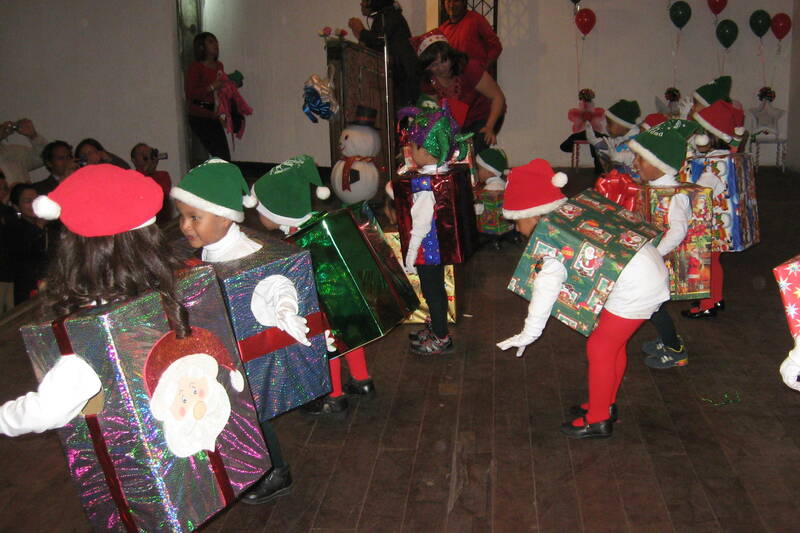 I know that Christmas choir and band concerts are not unusual in schools in the US, however, here, in the escuelas (elementary schools), each teacher is in charge of planning a song/dance, then a few days before Christmas, the schools puts on the program and invites the parents and members of the community. A couple of weeks ago, I attended the Oxford Gardens Christms program. 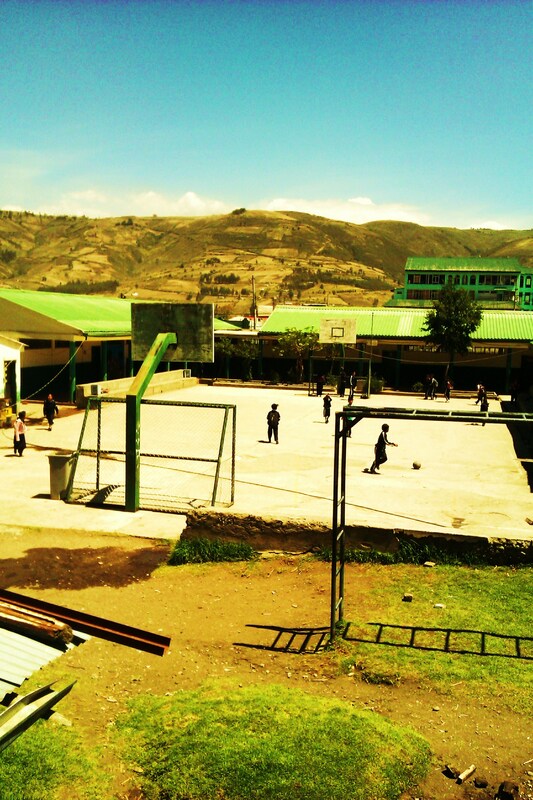 It’s the school where my English volunteer, Alice, teaches. I have so much respect for this kindergarden teacher, being patient enough to successfully teach 4 year olds a dance! These are the cuarto B and quinto classes, totally shaking their booties while dancing to this popular Reggaeton song! So funny. Time to address the parades. 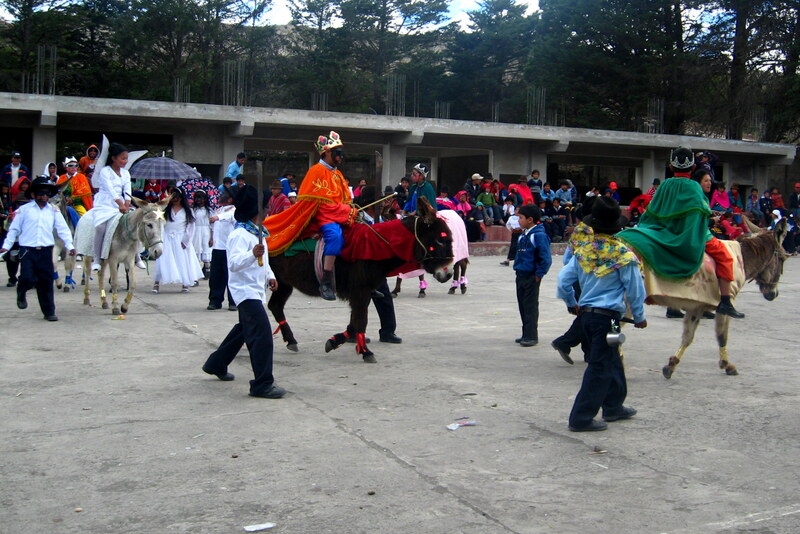 Parades are so common here that word for parade, “desfile” is not only a noun, but also a verb. For the last few weeks, it has been completely normal to be stuck in traffic because, suddenly, you are behind a parade. There were even parades Christmas morning, a time I figured everyone would stay inside their houses with their families. 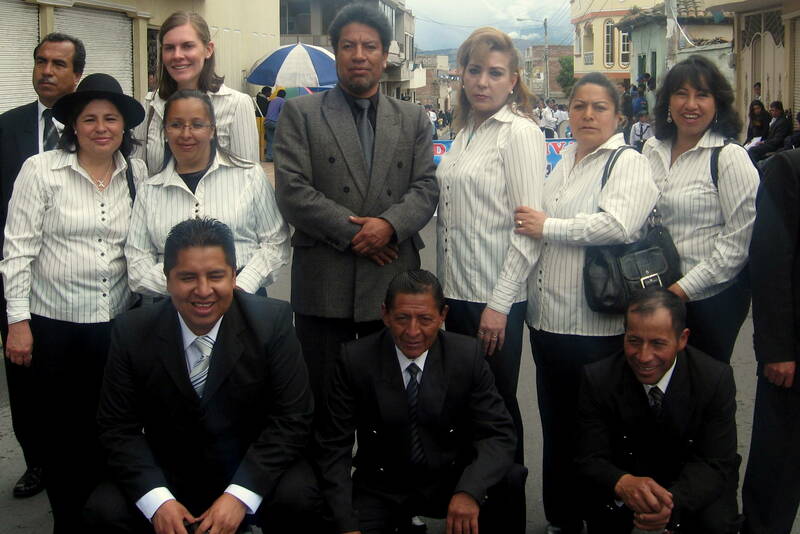 I actually was in a parade with my teachers at Once de Noviembre, the colegio I teach at, the 20th of December. I had to buy a uniform for this and I was pretty excited about it beforehand. 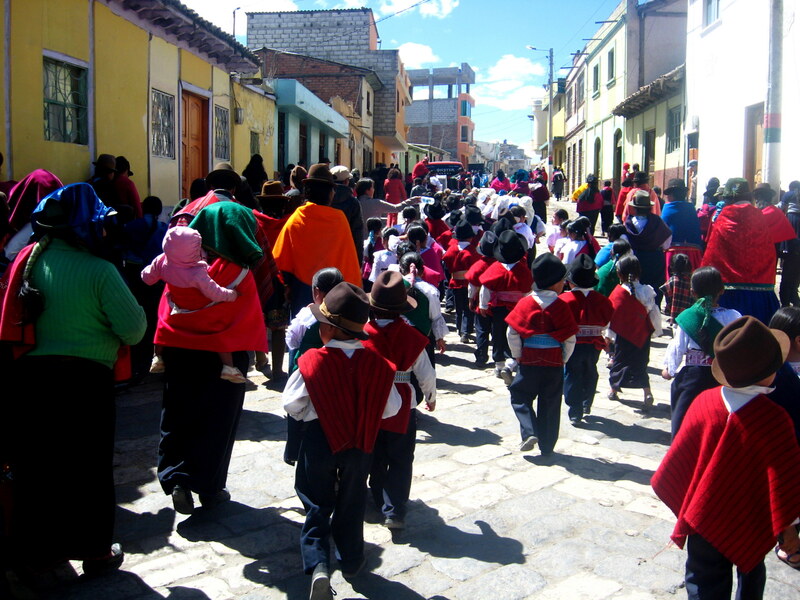 However, this parade was so huge (there were probably about 30 schools in it), that we were desfilando for perhaps an hour and a half. I was relieved by the time we reached the finish line. Some of my ornery boys! The students’ parents walked with the classes, making the parade quite a family affair. Just like most parts of my own culture and heritage, I had to spend Christmas in another country to really understand and value my own Christmas traditions. 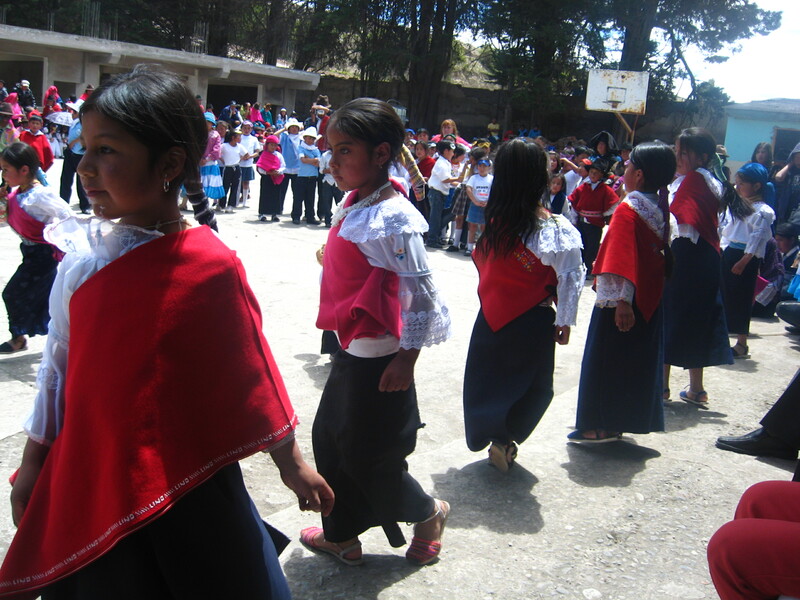 I enjoyed the holiday traditions of Ecuador as well. Hope everyone reading this had a nice Christmas, filled with the customs and traditions you know and love. If you are considering volunteering with TEV next school-year and will be here for the holiday season, you are in for some fun. Hi everyone, my name is Felicia and I’m one of the volunteers participating in the project ! As I see that Tricia already mentioned in former posts, I’m from Sweden. 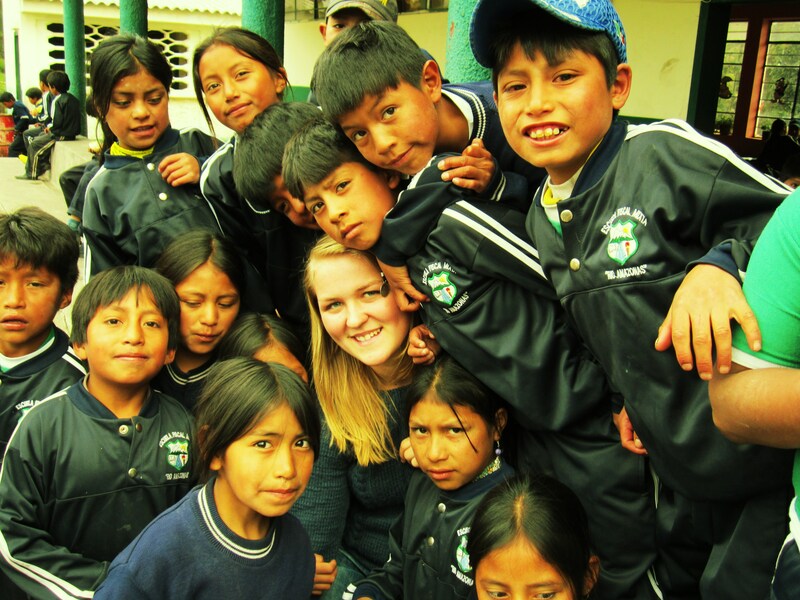 After studying spanish for nearly 6 years in Secondary and High School my dream was to travel to a South American country to use&improve my spanish and to get to know a new culture. but as I mentioned earlier I love learning languages and I consider myself fluent in English. I’ve really experienced the glory of being able to communicate with foreigners in their own language. For me, that’s the best feeling in the world and I felt like I really wanted to help other people experiencing the same. So I applied and HERE I AM, enjoying life at its fullest. But that was just a small introduction, I wont tell my entire life story, not right now at least, so I’m just going to tell you about my first christmas away from home! and we joke around alot so I thought they wanted me to GET UP AND DANCE with them, there and then! 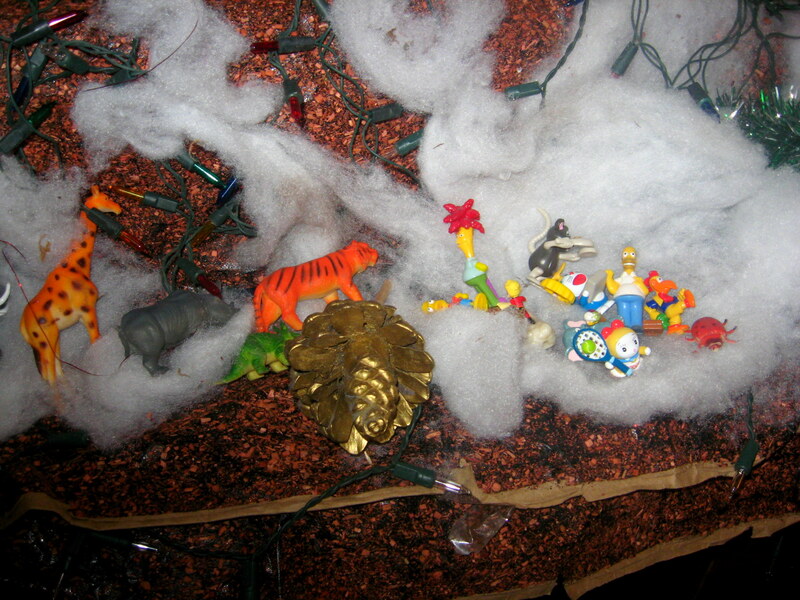 It turned out that I had agreed on participating in A BIG TRADITIONAL CHRISTMAS PARADE, “El pase del niño” …. 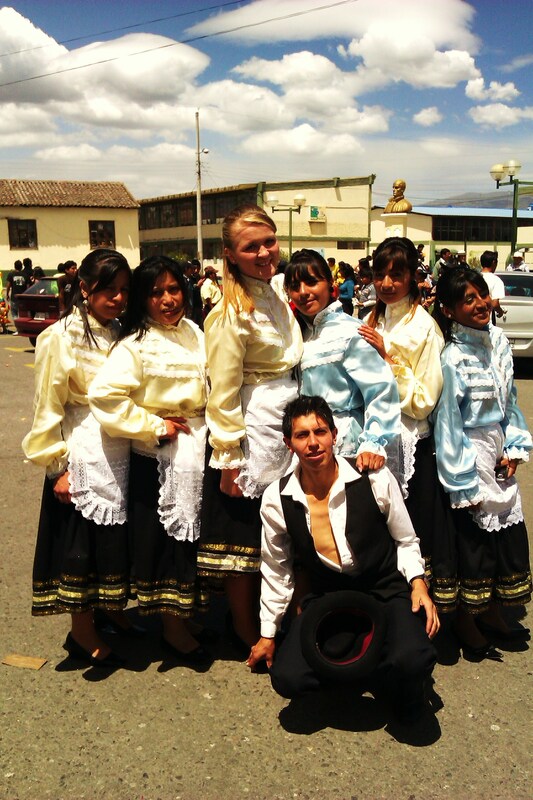 Suddenly I found myself dancing a traditional ecuadorian dance and really enjoying it. We practiced everyday for 2 weeks, but even the night before we didn’t know the dance perfect… Do I need to say that I was really nervous waking up at the BIG DAY? We had rented costumes, we were all made-up and stylish. The sun was shining from a clear sky.The square which was our meeting point were crowded with children and teenagers in different costumes. It was soon to be our turn. My heart was ponding, like crazy. When the music started it felt like all fell into place and we just danced of joy, regardless of all the people watching… It wasn’t PERFECT all the time, but it was lovely anyway! 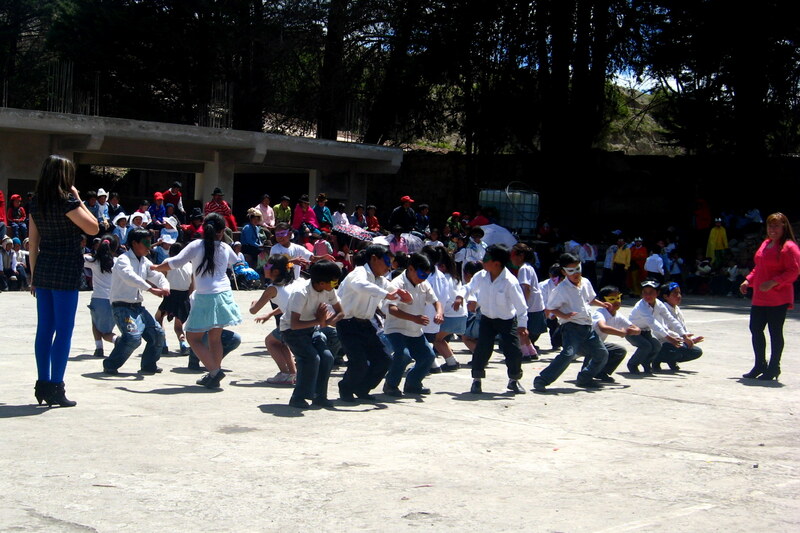 I estimate that we danced for around 2½ hours, and about 2-3 kilometers, but it felt much less, because it was so fun! Here on the other hand, the heat was nearly unbearable to dance in, 30 degrees celsius, and the strong equatorial sun really burned my face. Me and my students, all exhausted after dancing! The following day was 24th, the day we swedes celebrate christmas on. I thought it would be SUPER HARD to spend the christmas away from my swedish family, but after a Skype-session in the morning I felt completely calm and was really able to enjoy the ecuadorian way of spending Christmas. That was all I had to say for now, talk to you later! First of all, if you are planning on spending more than 3 months in Ecuador, you will need a visa. If you have a visa, it will need to be registered. 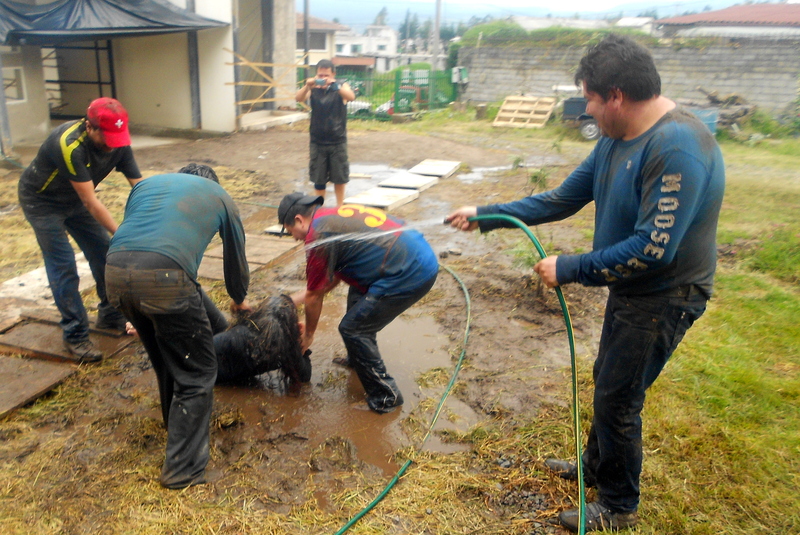 Here’s a detailed explanation of how that is done in Ecuador. Step 0: Before you can register your visa, you need to obtain a visa, no? Coming from the US, these were the things I needed to gather so that I could get a visa are as follows: a doctor’s note verifying that I would be fit for travel, a copy of my police record, a letter from my bank vowing that I would be able to support myself financially while in Ecuador, two-hundred and thirty dollars (es muy caro), my passport, the correctly filled out application forms (I quadruple checked them), copies of my plane ticket, and 2 passport sized photos (I went to Walmart to have these photos taken- fyi, you’re not allowed to smile in them [sad, I know]). I sent all of this in at the beginning of September, using Express Mail envelopes (and I had to include a self-addressed envelope)- adding $36 to the already hefty $230 price tag, and it was returned to me about two weeks later. The entire process, if you already have your passport, takes almost two months (factoring in making appointments with doctors, putting in requests for certified police records, etc.) When I received my self-addressed envelope toward the end of September, I gleefully ripped it open to find my Visa application stamped and my passport containing not just a new stamp, but an entire page filled in with details of my Visa. “I have my Visa, I have my Visa, yeah yeah yeah!” and I thought I was good. Step 1: Obtain the following items: original passport, a copy of the page in your passport that contains your visa and the entry stamp, a colored copy of the picture page in your passport, a carpeta con brinches (folder with claspes inside), and the Certificado de Visación (one of the forms you filled out when applying for your visa that was returned to you mostly looking the same, except for the addition of a nice, shiny stamp- do not make the mistake I made and neglect to bring this with you to Ecuador [I figured my Visa was in my passport, but no]… thanks to my mom and the US Postal Service for helping me avoid the potential nasty airport situation mentioned above). 6 de Diciembre is a pretty major road and it’s easy to use the inexpensive (25 cents) trolleybus (los troles) system to reach this building, or you can take a taxi for anywhere from 2-5 dollars, depending on where you’re coming from. You should have your folder with you, and in it should be all the documents from step 1. 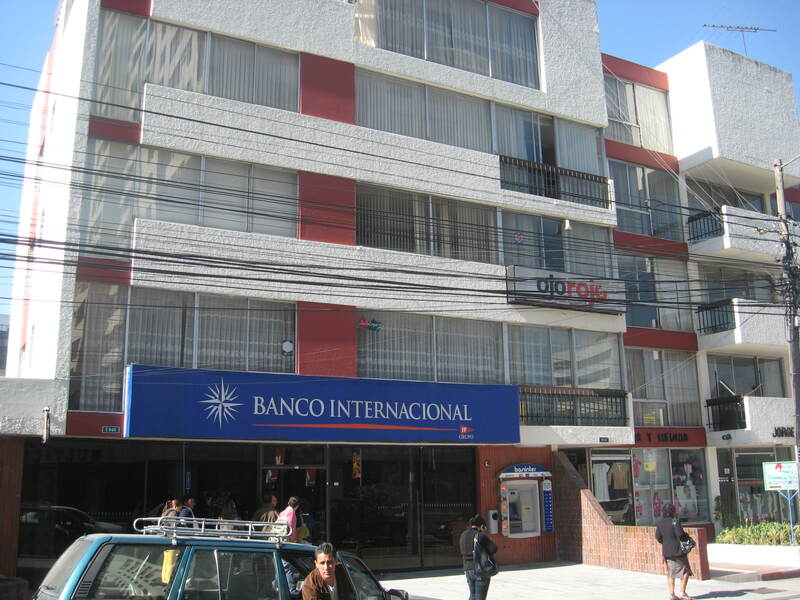 Wait in line for a minute, then when you get to the front, tell the clerk that you have everything you need in order to register your visa, but that you need to make the deposit at Banco Internacional. The clerk should give you a receipt or paper that gives you information on how to fill out your deposit slip. 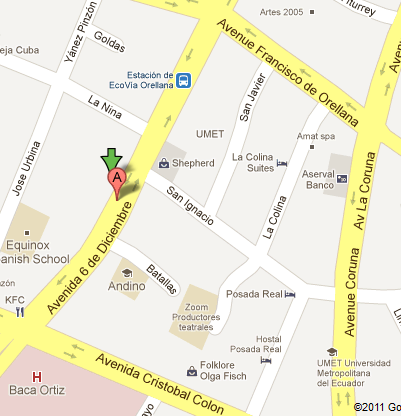 Direccion is the white building! Step 3: Walk out of the building, turn left, and turn left on the street La Niña. There you have Banco Internacional (on your left). It opens at 9 am, which is why I’m advising you to not be too early in all this (today, I had to wait for about half an hour outside the bank). Go inside and grab a deposit slip. Use the paper you were given a minute ago to fill this out correctly, then wait in line to make your $10 deposit. Felicia and I were talking about how much more complicated this is in Ecuador than it would be in our home countries- this going to another building to pay the processing fee nonsense, but it’s not that difficult. Once you’ve made your deposit, keep your deposit slip. Head back to the Dirección General de Extranjería, show the clerk your documents and deposit slip, and you will be given a number. Step 4: Wait. Felicia had to wait for a few hours. I could hardly believe it when my number was called (well, not called, but rather projected on a TV screen) after a mere five minutes of waiting. Step 5: Hand everything to the employee. She will hole punch all the papers that you brought and stick them into the clasps of your folder. She will then fill out a piece of paper, hand you the carbon copy, and tell you to present it tomorrow when you come to retrieve your passport. Step 5.5: Spend the afternoon enjoying Quito! It’s a lovely city. Step 6: Return the next day and get your passport, which will contain a Ecuador visa page that is now enhanced with a registration stamp. Done!